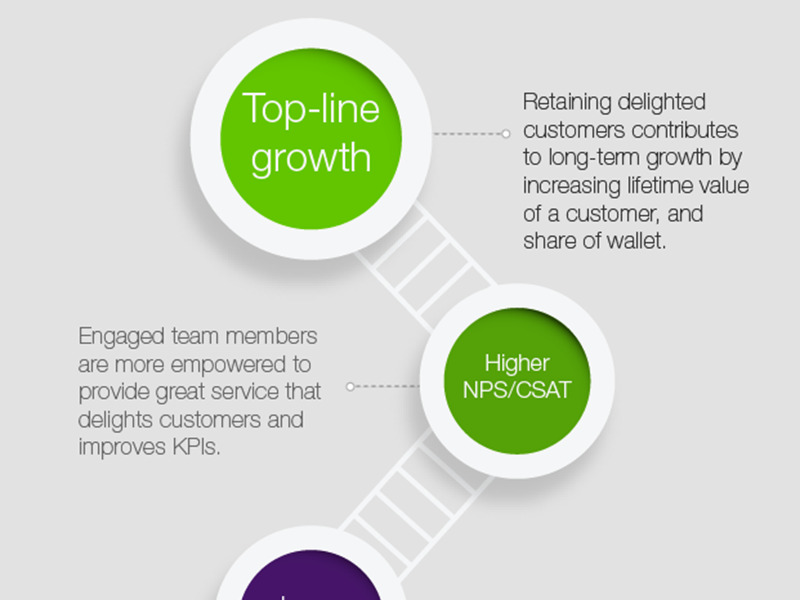 High staff attrition is the curse of the contact center. It’s not uncommon for turnover rates in the contact center industry to hit triple digits on an annual basis, and replacing and training new employees can cost in excess of 25 to 30 percent of agents’ salaries. Consulting firm Deloitte polled young workers in 29 countries for its 2016 Millennial Survey and found that a majority of Millennials had one foot out the door at their current workplaces. Latin America and India had some of the highest percentages — 71 and 76 percent, respectively — of people who expected to quit in the next five years. Further, according to the U.S. Bureau of Labor Statistics, people between the ages of 20 to 25 — the majority base of contact center employees — leave jobs within 1.3 years of starting them. These statistics beg the question: how can a contact center possibly hold on to its most valuable staff and cut down on expensive, time-consuming and resource-intensive hiring and training? We spoke to David Tull, Customer Care Manager at menswear e-commerce site JackThreads, and Kevin Bottoms, Global VP of Business Development at TELUS International, to uncover some of intricacies of lowering attrition. Tull, who oversees a few dozen in-house customer service associates at JackThreads’ Columbus, Ohio headquarters, says that over the five years he’s worked there, he’s learned to readjust what “retention” means. But even in a contact center that almost exclusively hires young, motivated people, there are important factors to consider. How do you boost employee morale and retention rates in a larger contact center scenario — for example, a business process outsourcer (BPO) with thousands of employees — where call volumes, as well as burnout potential, can be impossibly high? The secret is simple enough, according to Kevin Bottoms; you have to care about your employees and their aspirations. 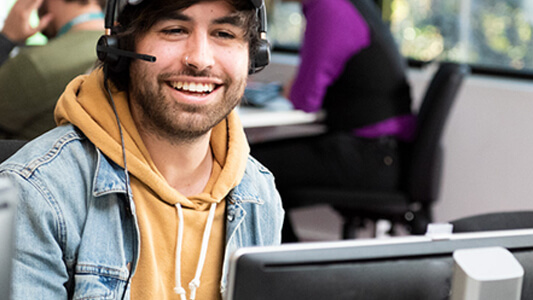 As Bottoms points out, contact center jobs are not typically long-term careers for Millennials, who make up the largest portion of the company’s talent pool. To boost employee retention, Bottoms says the company focuses a lot of attention and resources on ensuring TELUS International team members are continuously supported and engaged throughout the term of their employment. 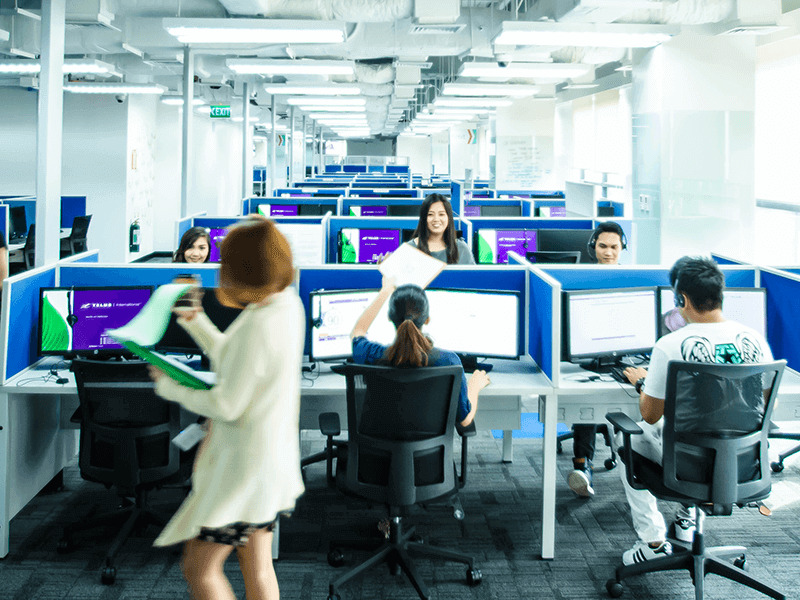 For a BPO provider like TELUS International, which operates contact centers around the world, that means ensuring the programs the company offers in its regional locations are in line with the aspirations of the local workforce. For instance, TELUS International’s university programs help team members in the Philippines and elsewhere get Bachelor’s or graduate degrees on site while working full-time. Additionally, in Central America where societies are more tightly focused on family and community, the company offers employees — and their families — health insurance . These programs are part of TELUS International’s unique and caring culture, Bottoms says. Tull agrees that focusing on making employees as happy and satisfied as possible is essential to a contact center’s success. He says job satisfaction at JackThreads’ in-house contact center is at the highest it’s been in years. “Some of it is low-hanging fruit, like free coffee,” Tull says. More important, however, is offering a better time-off policy than it had in the past, elevating and assigning more responsibility to ambitious people, as well as investing resources and money into career development. Bottoms says that it’s unusual for many outsourced contact centers to invest heavily in what are, ostensibly, temporary employees. Outsourcing is typically built on the goal of answering a maximum number of calls without introducing risk to the brand being represented by the outsourcer. The quality of service is usually acceptable but not exceptional, in order to pass on savings to the outsourcer’s clients. Here, employee engagement can be quite low, and attrition is usually high. That model, says Bottoms, is broken. “If you’re only looking for cost savings, you’re going to achieve it on a paper basis, but are you achieving it on a strategic basis?” he asks. He says TELUS International attempts to replicate the environment of a company’s in-house customer care department, in a larger outsourcing operation. The company has gone to great lengths to ensure the needs of its team members are met, while maintaining strict quality standards. 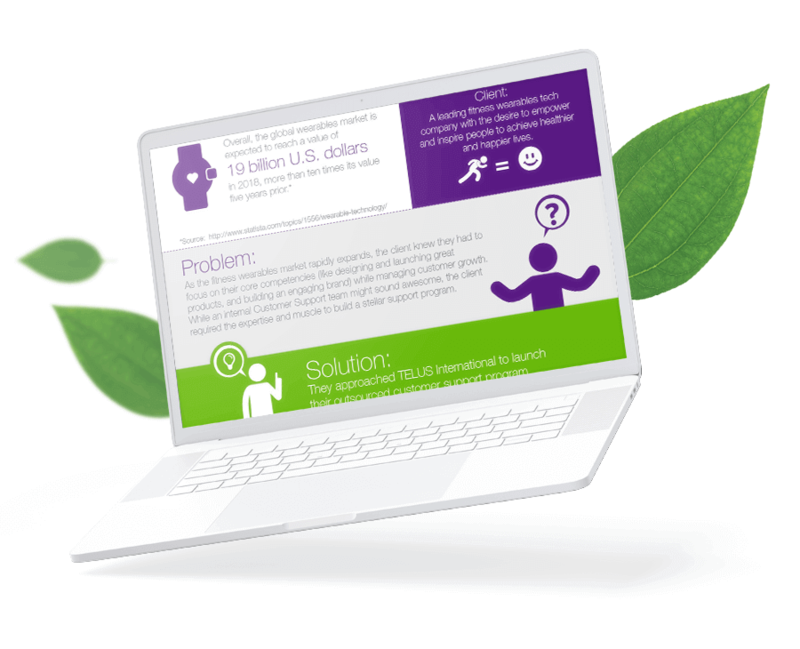 Regular check-ins — from a daily “How are you?” to annual performance reviews — help TELUS International take the pulse of its contact centers and remain aligned on the overall mission of the organization despite great geographical differences. For startups and other young companies, learning how to manage a contact center and its staff is often a trial-and-error process. That was definitely true for JackThreads. When the company first began in 2008, it had a simple mission: sell brand-name men’s clothing at up to 80 percent off the suggested retail price. Over time, however, things began to change. By the time a new CEO was brought in in 2014, “the pressure for JackThreads to keep hitting its metrics and revenue targets was taking a toll on the morale of its employees, its customers and its product quality,” Forbes reported earlier this year. Its credit-only return policy was a major source of customer consternation, and for years the company encouraged agents to make exceptions to the rule on a case-by-case basis. That, combined with the feeling they were nickel-and-diming customers over already rock-bottom prices, left agents exhausted and listless about their primary task, while simultaneously being spurred to hit sales targets. Soon after the new CEO took over, JackThreads replaced its credit-only return policy with a free at-home-trial policy. Around the same time, it also began offering private label JackThreads menswear and became more selective about the external brands it sold. Those moves resulted in two important consequences. First, Tull says cart abandonment has gone down, basket value has gone up and online brand sentiment has grown positively since then — indicators that customers are happier. Happier customers, in turn, have made for happier workers. Contact center employees’ jobs have shifted from almost exclusively handling complaints, to a more proactive stance in which they consult customers about their wardrobe choices and make suggestions about complementary items. Having more purpose to their work, without the immense pressure to hit targets, has boosted employees’ morale. JackThreads’ and TELUS International’s experiences show that making staff feel valued, fostering a supportive work environment and instilling a sense of pride and agency in the work goes a long way in improving job satisfaction in contact centers. Those factors can also be a major boon to business. “Now that the friction is gone, it’s about trying, and taking risks and using that to grow,” Tull says.